I was paging through the delightful Barflies and Cocktails by Harry McElhone, one of the wonderful reprints by Mud Puddle Books. Amongst all the wonderful illustrations by Wynn Holcomb, I found a variation on the martini that was new to me. 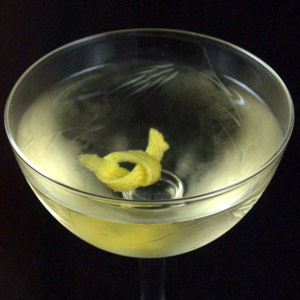 stir and strain into cocktail glass, garnish with lemon twist. This is a great variation to my tastes. It takes the venerable dry martini and adds just enough absinthe for that wonderful anise scent and a hint of taste, and just enough grenadine for just a little sweetness. I tried this with both a blanche (Kubler) and verte (Pacifique) absinthe, and found the blanche worked a bit better. The Kubler brought a great balance while the Pacifique, even at just 2 dashes, wanted to assert itself too strongly in this mix. In the spirit of Harry’s New York bar, still located at 5 Rue Daonou in Paris, I used Citadelle, a French-made gin. This cocktail is another great example of how just a little bit of a strong ingredient can change a cocktail for the better. My Gloom Raiser I mix with Pernod – classic absinthe substitute. Also I squeeze essential oil of lemon peel over cocktail (similar to Dry Martini). The results are perfect! In my opinion the Gloom Raiser is gobsmacked cocktail.